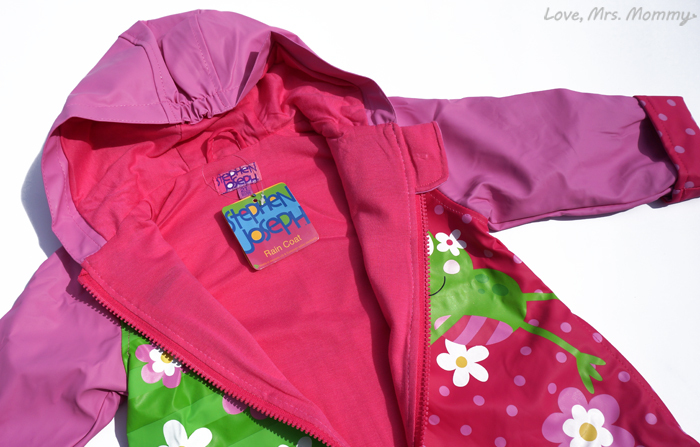 Love, Mrs. Mommy: Making Rainy Days Look Bright with Stephen Joseph Raincoats! Making Rainy Days Look Bright with Stephen Joseph Raincoats! I received this raincoat at no cost to facilitate this review. All opinions are my own. With Memorial Day behind us and Summer coming our way, we are bound for some beautiful weather ahead. But with all that warm weather, don’t forget what that brings… summer showers and thunderstorms. Even though it might be warmer, you still don’t want your child(ren) to get soaked by it. Oh no! That’s why I am excited to partner with Stephen Joseph who makes the most adorable raincoats (and more) that you have ever seen! Stephen Joseph has been around for 35 years and they have stayed true to the core values their company was founded on. They believe in focusing on the details, producing the highest quality products, and making their customers happy! That sounds positively perfect to me! With all the adorable raincoats Stephen Joseph has to offer, it was quite the process for me to narrow down my selection to just one. 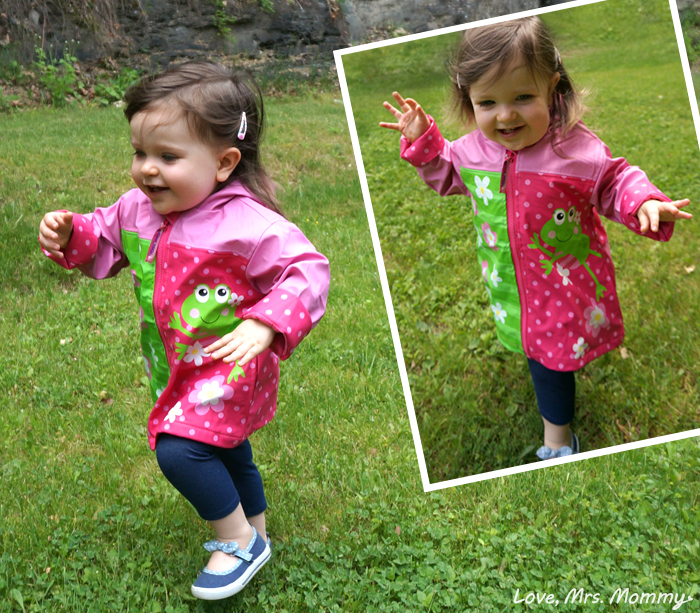 I finally decided on the “Girl Frog” raincoat as my daughter loves flowers and I knew she would just love that cute, happy little frog on the front and back of the coat. Boy, was I right! When the raincoat came, my daughter was so excited over the frog. She kept flipping the coat from front to back to check everything out. My sweetie even pointed out that the frog had a flower on her head, and said “girl frog”. So adorable! She loves her raincoat so much so that she even enjoys carrying it around the house! The quality of this raincoat is undeniable. The material is both lightweight and durable and the details are impeccable. There was definitely a lot of time and care that went into the design of this rain coat, and it shows. The cotton lining is soft and comfortable and the sleeves have an adorable rolled up print that matches the polka dot pattern on the coat. They really thought of everything with this jacket, right down to the safety zipper cover at the neck and the elastic gathering at the hood, so you don’t need to have a tie. Plus, this adorable coat is machine washable too! You can tell that with all these thoughtful details, Stephen Joseph knows what they are doing and they are doing it well! 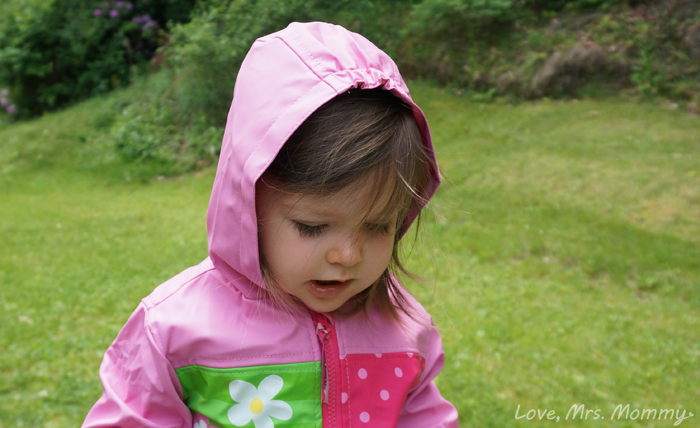 With Stephen Joseph rain coats, being outside in the rain never looked so cute! Connect: Find out more about Stephen Joseph by visiting their website. Then make sure you “like” them on Facebook and follow them on Twitter. Buy It: You can purchase this raincoat and more on their website.